UNC-Chapel Hill student Hiwot Ekuban stood in the middle of Lenoir Dining Hall smiling into a camera and holding in front of her a small whiteboard. Freshly scribbled across the board in pink dry-erase marker were Ekuban’s words of support for those with mental health concerns: “Beyoncé says ‘Mental health is important!’” The world-famous superstar has publicly acknowledged a depressive episode in her past. Ekuban was participating in the Stigma Free Carolina campaign. Started by three Royster fellows, the campaign seeks to raise campus comfort with acknowledging mental health concerns and to encourage those experiencing such concerns to seek help. The three fellows led a campus planning committee of over 30 individuals representing more than 15 campus departments and organizations. Royster fellow and doctoral student Nikhil Tomar got the idea for the campaign when he saw a 2010 Healthy Minds study showing that while half of UNC-Chapel Hill students thought others would think less of them for having mental health problems, 90 percent of Carolina students responded that they would not think less of someone with a mental illness. “There was this huge gap between the perception of stigma and the reality,” Tomar said. This over-perception of stigma is a problem for those who need treatment for mental health issues. Research shows that the perception of stigma can delay or prevent people from seeking treatment. Tomar said his conversations with campus mental health counselors further confirmed this trend. “UNC has lots of mental health resources, but students are coming in late. So why are they coming in late? Research has shown that stigma is one of the factors,” Tomar said. Tomar teamed up with two other Royster fellows and doctoral students, Nelson Pace (epidemiology) and Todd Jensen (social work), to begin a social media campaign to reveal the true strength of support on campus for individuals who experience mental health concerns. 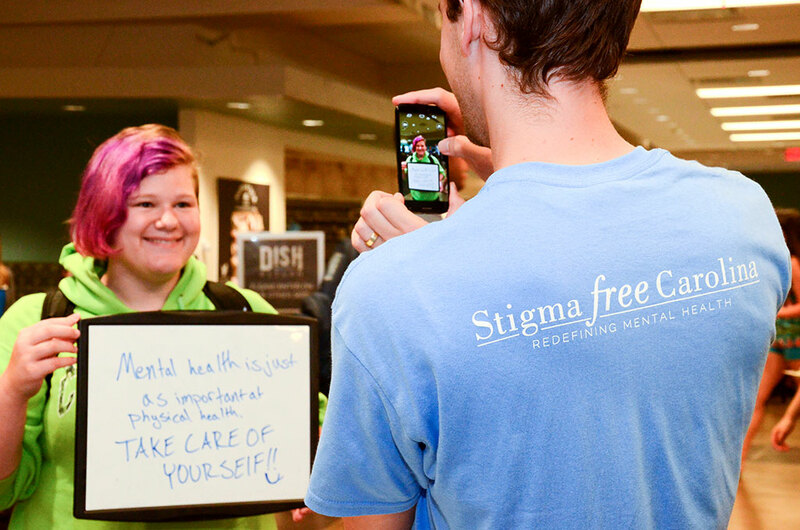 Students, like Ekuban, take pictures of themselves holding messages of support and post them to social media using the hashtag #StigmaFreeCarolina. Tomar, Pace and Jensen believe revealing the level of campus support will make people feel more comfortable talking about their concerns and seeking help. Jensen said what started as a small social media campaign quickly grew into a multi-pronged, campus-wide effort to plan education and training focused on stigma and mental health on campus. “Pretty much everyone we came into contact with was right on board,” Jensen said. The campaign now includes several educational events throughout the fall, including a panel discussion and interactive theater held in early October. Faculty, administration, student groups and staff have all expressed interest in joining the effort. The kick-off event was held in Lenoir Dining Hall on Sept. 12. That’s where Ekuban and other students had the opportunity to be among the first to post using the hashtag #StigmaFreeCarolina. Students also lined up to spin a wheel and answer trivia about mental health. Winners received UNC Student Stores discount vouchers. To encourage attendance for the kick-off lunch, Carolina Dining Services also presented a discount to all campus members who didn’t have a meal plan. But all who participated learned at least a few more facts about the campus’ resources and the prevalence of mental health issues. 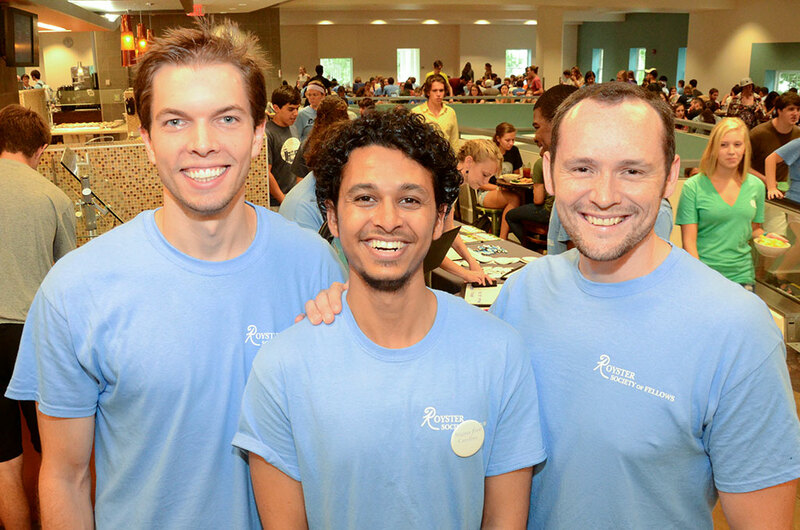 Nikhil Tomar (middle) initiated the idea of Stigma Free Carolina. Nelson Pace (left) and Todd Jensen joined Tomar to lead a planning committee including more than 15 campus organizations. Tomar said he hopes events like the kick-off will help make people more comfortable talking about mental health. The panel on Oct. 6 brought together several faculty and community experts on mental health, including faculty chair Bruce Cairns. Jensen said he hopes educational events will not only decrease stigma and its perception, but also redefine how the community understands mental health. “Mental health is a spectrum, and we’re all somewhere on that spectrum,” Jensen said. Pace said the ultimate goal is to change the culture surrounding mental health on UNC-Chapel Hill’s campus and provide a model for other college campuses to follow. ♦ Written by Jess Clark, master’s degree candidate in the UNC-Chapel Hill School of Journalism and Mass Communication. You wouldn’t judge a diabetic for needing to take insulin, you shouldn’t feel shame for something you can’t control…. I don’t think any less of anyone with a mental disorder…. Next time you talk to someone, don’t think how sensitive the issue is, or how taboo the topic is, just talk.